Undergraduate Bhikkus vowed to continue their week-long satyagraha over allegations that State universities intend to limit the intake of student monks. 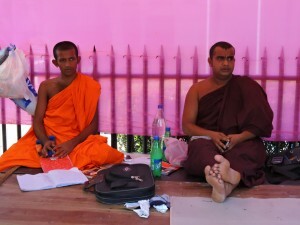 Inside a makeshift tent in front of Fort railway station, student monks lie in protest, waiting for authorities to give a solution to the problem they consider a serious threat to student monks who wish to pursue higher studies. The Inter University Bhikku Federation (IUBF) said Higher Education authorities have failed to provide a permanant solution to increase the intake of student monks. Student Bhikkus who clashed with police on April 29, opposite the University Grants Commission, say they will continue with their series of protests. Last month’s clash resulted in five student monks and two police officers being injured, while another two students were arrested for damaging State property. Kelaniya, Ruhuna, Sabaragamuwa and Sri Jayawardenapura university undergraduates joined their fellow monk colleagues in last week’s protest in Fort. 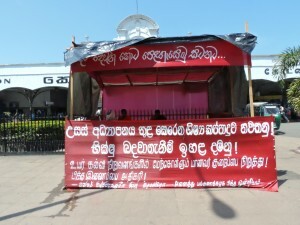 IUBF Convener, Gnanananda Thera said they have been protesting for over a month, against the alleged move and have yet to receive a positive response from Higher Education authorities. He said the protest was aimed at educating the public of their issue.